Michels, an undergraduate at the University of Wisconsin–Madison who has type I diabetes, thought, Why not try to focus on diabetes? 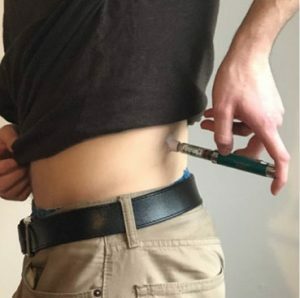 He formulated an idea for a plastic attachment to his insulin pen in order to stabilize the needle and allow simplified one-handed insulin injections. He calls this injection aid “Steady Shot,” because it holds the needle steady during injection. Type I diabetes is an autoimmune disease which lowers the body’s production of the hormone insulin. When insulin is secreted by the body, it signals the body’s cells to take up glucose from the bloodstream, providing cells with a source of energy. However, in diabetes there is a problem with the insulin signaling and the glucose remains trapped in the bloodstream, unable to enter the cells. Insulin injections, one form of treatment for type I diabetes, help replenish some of the insulin the body is lacking, raising levels back into the normal range and allowing cells to access their food source. The Steady Shot in use. The average type I diabetes patient has to self-administer about three injections each day to maintain their insulin levels. Unfortunately, these injections are complicated by the fact that the user currently has to employ two hands; one to hold the needle and one to pinch the skin. This limits the area the injections can be applied to places the user can access with both hands, mainly the stomach and thighs. But with Michels’ Steady Shot, the plastic attachment to the pen substitutes for the second hand to pinch the skin and create a bulge of subcutaneous fat. This allows one-handed injections, allowing the user to access many more areas than just the stomach and thighs, thus reducing the bruising and discomfort that develops from continuous injections in the same spots. Once Michels had his idea, he wanted to test it out. He sketched out a design and took it to his dad at his home in Oconomowoc, Wisconsin. “I found the parts in his garage and then he welded them together for me,” Michels recalls, highlighting the support that his family has given him along the way. With his dad’s help, Michels had his first working prototype. From there, he was able to transform that model into various 3D-printed versions, trying each one out until he found one he liked. Immediately, he was able to see the results. Once Michels had his prototype, he sought help from Discovery to Product (D2P) to work through the process towards commercialization. 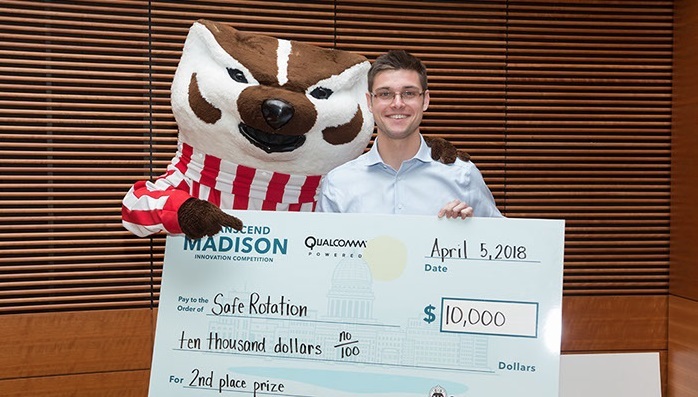 D2P at UW–Madison is a campus resource promoting the commercialization of innovative ideas and research from university students, faculty and staff. Building on a history of collaboration with the University of Wisconsin–Madison and Wisconsin Alumni Research Foundation (WARF), D2P is able to provide the campus with startup mentoring, entrepreneurship advising, access to project funding, and workshops, among other things. Michels was accepted into D2P’s Igniter program. Igniter helps project teams develop the strategies and materials they need to move their product or service from the lab or dorm room to the market. The Igniter program begins with an intensive five-week sprint that includes a weekly series of three hour workshops. After Igniter concluded, Michels continued to work with Robert Pozner, one of D2P’s mentors-in-residence. The two began working together to design a business strategy, refine the prototype design and develop a marketing approach. What had once started as an idea for Michels over one winter break was on its way to becoming available for consumers. First, however, Michels and Pozner would have to navigate the tricky process towards gaining FDA approval. Because Steady Shot is classified as a medical device, it is required to pass through more FDA regulations than initially anticipated, which proved to be a time-consuming process. Until Steady Shot was correctly classified under the FDA, no one other than Michels himself was able to test the device out, meaning he was limited in the amount of feedback he could receive to improve his device. With help from D2P funding, Michels was able to access several FDA consultants, although their advice wasn’t always clear-cut. Fast forward to today, and the prototype is almost through development, leaving Michels eager to move forward. With FDA approval on the horizon, Steady Shot is ready to move to patient trials. Leveraging their combined network, Michels and Pozner used their connections to arrange patient testing at UW-Health, which will begin soon. All in all, the future is looking promising for Michels’ injection aid, and he says he looks forward to what it may bring. Ideally, he explains, he’d like to form a startup around his technology. Although he acknowledges that there will be challenges along the way, he knows it will be a rewarding process. And he’s already part of the way towards the goal; Michels has already filed a patent on the injection aid. As Michels anxiously awaits the day when he can provide Steady Shot to those who need it, he himself has already benefitted greatly from his prototype. His bruised thighs have gotten a rest and Michels is able to use more comfortable areas. What advice does Michels have for those looking to commercialize their own product? 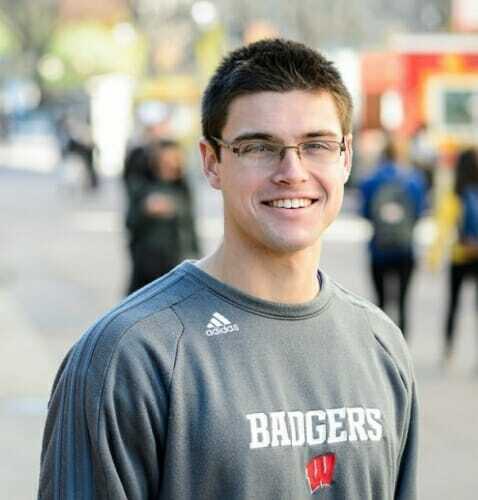 In the meantime, Michels is looking forward to graduating with a double major in accounting and marketing, and a certificate in entrepreneurship, and seeing where Steady Shot takes him.